*Make Gyotaku, exquisite fresh fish prints. Or use rubber ones, and get all the supplies, here. *Craft your own classic fishing lures. Or try para cord, bottle tops, & spoons. *Press out a few gorgeous fish ceramic bowls. *Go fishing in your living room with this truly beautiful, simple stick-&-spool hack. *Build a wood, copper & bead mobile. *Fly some Koi kits, out of tissue paper, felt, & fabric. *Try your own take on fishy rock magnets. *Create a large-class or whole-school (of fish) hanging clay installation. 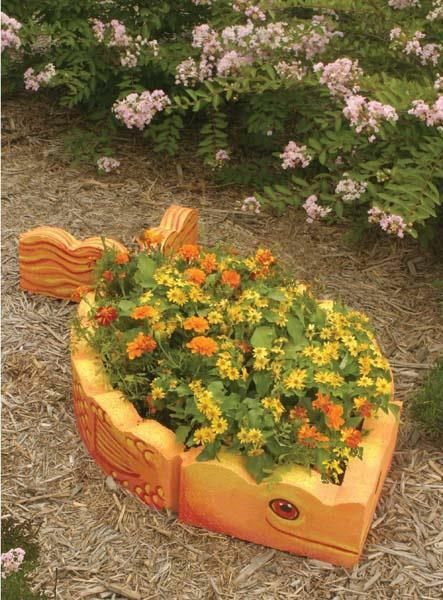 *Make a fishy garden bed using curved pavers and outdoor mural paint. *Do an Earth-friendly Fish Tasting. Get 3 kinds, add seasoning, toss them in rice flour, brown in butter & sear with lemon slices. Discuss. Are you global? Take it further. *Press out a pro-looking stack of summer thank you notes with a styrofoam produce tray. *Make a tricky whale invite. Sure. Whales eat fish. There's suckers, skimmers & gulpers. It's all in this big ol' PDF curriculum for grades 6-9 from Oregon State. *Make some goldfish crackers from scratch. *Grow triops. They're like if Triassic sea monkeys & scorpions had babies. *Or hatch some luminescent killifish & learn about embryonic diapause. *Catch the edge of ocean exploration, ecological opportunity and current crises with these 11 TED talks. *Tell some fishy tales & serve up some tayaki, stuffed fish-shaped pancakes. *Create your own wee community pond or bog & do some dipping. Identify critters & take a tally as a family. *Make simple field guides of your local fish in these blank books. While you're at it, create a game around them with these round gameboards. *Geek out on the history of fish. Go deep by collecting images & drawing out an epic display. *Follow along with the Future Fisherman Curriculum. Fish, then clean, store & filet dinner. *Feeling motivated & engineer-minded? You can make your own seahorse tank. But this driftwood version is actually just as pretty. *Turn your existing 20-gallon tank into an advanced science-&-math farm-lab by going down the aquaponics rabbit hole. Or keep it sweet & simple. Here's how to care for that hard-working-finned-farmer. *Improvise your own simple stick + twine version of this intricate hazelwood fish trap.